just when it comes to educating your kids and people working in most of the other public-sector jobs. Even he felt compelled to respond to all the guffaws on the Interwebz about his love for the union of football referees. 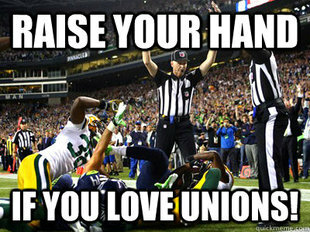 Being pro-taxpayer doesn't make me anti-union. Besides, private sector unions are often our partners in economic development. The Governor didn’t want Replacement Refs hurting his prospects for growing the number of jobs for people hawking Packers gear around the Cheese State. Well Governor, if you think the Replacement Refs were bad for the state, just wait a few years and we’ll all start to see the impact of the Replacement Teachers in Wisconsin. We do need to be fair to the man. He isn’t against all public employee unions. He graciously spared the police and fire unions, as well as the State Patrol Troopers and Inspectors from his mighty sword. But teachers and other education workers (low-life, scum, bottom of the public employee barrel) lost most of their collective bargaining power. In particular, his Budget Repair Bill limited “collective bargaining to the base pay rate.” There will be no bargaining over pensions, health insurance, or any other issues besides base pay. Teachers and other people employed at educational institutions will leave their jobs for greener pastures. You also say that you don’t believe this, that it’s made up of idle threats. Please read to the bottom. Those who remain in their jobs will no longer use the employer-provided health insurance options – BECAUSE THEY CAN’T AFFORD TO. There’s lots of people out there who say that public employees don’t need unions because they don’t need to be “protected” from their employers, which is the government in one form or another. Think again. And I don’t give a damn about what FDR said back in 1937 about public service unions. This is 2012, and times are different. More to the point, politicians are different. There’s not an FDR in sight. I’m sure that many are rolling their eyes and thinking that I’ve bought into the liberal talking points – hook, line, and sinker. Let me tell you why I believe this. To illustrate the point, let’s look at the health insurance “benefits” for the School District of Superior, Wisconsin, where I happen to live. Before Walker’s axe fell, school district employees had annual health insurance deductibles set at $1,500 for a family. Drug co-pays were included whether you had hit the deductible max or not. Once the deductible was met, other health costs were shared on an 80 percent-20 percent co-insurance split, with a family paying up to maximum of $4,000 out-of-pocket in a given year. Those were the terms for the last contract that was collectively bargained, which ended June 30, 2012. On July 1, the new “Employee Handbook” went into effect and changed the family deductible to $6,000 per year; and eliminated the drug co-pay provisions until that deductible of $6,000 has been incurred. Let me make sure that you understand what I’m saying. There is absolutely no payment by the insurance company on your behalf until you have paid the first $6,000 in health care costs incurred during the year out of your own pocket. The school district announced that the changes in health insurance would save the district $1.5M each year. That savings is based on the assumption that all employees would continue to use the new health insurance if they were using the old. That assumption is very faulty. Many employees can no longer afford the insurance, thereby reducing the employer’s cost of premiums (fewer insured, fewer premiums paid to ins co.) and saving them even more money. So, sing hallelujah! The school district budget crisis has been solved, and then some! No pity needed for the employees who have seen their compensation package severely reduced – no pity since they are the scum of the earth. They deserved it, right? Let’s also take a look at the societal cost of this “benefit” (quotes marks intentional). The cost of the family insurance premiums comes to a total of approximately $15,000 per year, paid jointly by the employer and employee If you have $6,000 in health costs, then you have paid (and your employer, on your behalf) a total of $21,000 for $6,000 in health care. No wonder the insurance companies love the Governor. I wonder how many Tea Party supporters there are in the ranks of school employees? I’ve met a few, so I know they’re out there. How do you like your Governor now? How terrible do you think collective bargaining is now? How much do you love your health insurance coverage? (Note 1) I took the $3,470 average out-of-pocket health care costs for a family of four and inflated it to the estimated $4K-6K range based on the fact that they would have to pay more for drugs since co-pays wouldn’t kick in until after the deductible is met. How much more depends completely on the type of drugs needed, and on whether they would continue to purchase the drugs they NEED given that they are so expensive. One migraine sufferer told me directly that she would just have to go without her migraine-fighting medicine. (Note 2) There is a second option for school district employees. Known as the “low-deductible” plan, you can get a more reasonable deductible and drug co-pays IF you have over $6,500 (teachers) or $7,500 (secretaries, for example) deducted from your salary. This “low-deductible” plan is even less affordable than the one mentioned above. One last thought to chew on. Maybe you think that teachers are overpaid and under worked. You’re entitled to your opinion. This change also affects school secretaries, custodians, food service workers, and many other employees who make as little as $20K per year, before taxes and “benefits” deductions. If your take home pay is $14,000 a year, how easily can you afford $6,000 in out-of-pocket health care costs? I know, I know, it’s not your problem. So, you’re right. Public employees do NOT need collective bargaining, because nothing bad could ever happen to them. Right?